Oceanfront Paradise at Holiday Villas III- wowza!! New Kitchen: New cabinets, granite countertops with stainless steel double undermount sink and new faucet to match. Breakfast bar with 3 new barstools with coordinated material matching seats and drop down light fixtures. New stainless steel applainces: garbage disposal, glass top stove and microwave, dishwasher, refriderator with icemaker. New matching dishware, glassware, silverware, pots/pans, coffee maker and 4 slice toaster. your life, nature has supplied it all in abundance on Florida's gulf coast. Holiday Villas III allows for one of the best front row seats to this picture perfect view of natures creations. • Linens/Towels AND POOL TOWELS provided!!!! 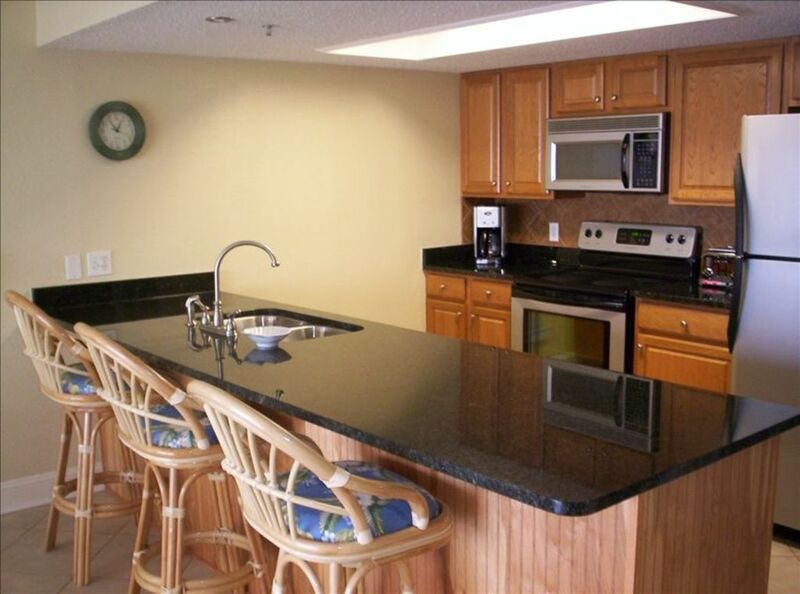 We pride ourselves on providing our guests with a great experience in our condo. As you can see, our condo is newly renovated and we hope you enjoy your vacation as much as we do when we are at Holiday Villas III. Spacious condo and very clean. Not over crowded. Love this place. Justin, thank you so much for leaving such a nice review. We are glad you enjoyed your stay at HOLIDAY VILLAS III. Please do not hesitate to contact us anytime you want to return, we would love to have you as a guest again. My husband and our 2 children stayed a week for our vacation recently. This is the most beautiful condo we've stayed in. The first thing you will see when you walk through the door is the panoramic ocean view. This unit is directly on the beach. The beaches in this area are flat and close to the building. The pool is between the beach and the condo. It is perfectly beautiful and convenient. The 2nd thing that hit us when we walked in was that this condo is very spacious, especially for a condo! The living room and kitchen are large, as well as the bedrooms. Even the bathrooms are bigger than we normally see in a condo, with both full bathrooms having a full-sized shower. There is plenty of closet and drawer space in the rooms, and TVs in both bedrooms and the living room. The kitchen is well-furnished. Freezer has and ice maker. The condition of the condo was exquisite. I believe it has been recently remodeled, and has beautiful upgrades throughout. It was pristine and clean, and the furniture was heavy, solid, and high quality. Beds were very comfortable. The décor is simple and elegant, without a hundred little glass figurines for my kids to break (really appreciate that!). The laundry is outside the condo and is coin operated, but it is right outside the door of this unit and we found it to be available whenever we needed to use it. The pool area has an abundance of pool chairs. The grill area is nice with plenty of seating and tables for several families to use at once. Garbage chute is also available outside the condo, and there is elevator access to the condo. The area is also nice. The shuttle stop is right in front of the condo building. We hope this condo is still available next summer. We will definitely be coming back! * Visa/Mastercard/Disc accepted * Rates shown are in US $ and do not include linen fee, departure cleaning fee and 13% Florida tax * Weekly rentals are from Saturday to Saturday. * Must be over 25 years of age to rent. This is a family oriented resort property. * Rates and terms are subject to change until confirmed with deposit. * Sorry, no pet policy mandated by association.